Event no. 19, the $5,000 buy-in pot-limit hold’em event at the 2013 World Series of Poker, drew 195 of the game’s best and featured yet another stacked final table. 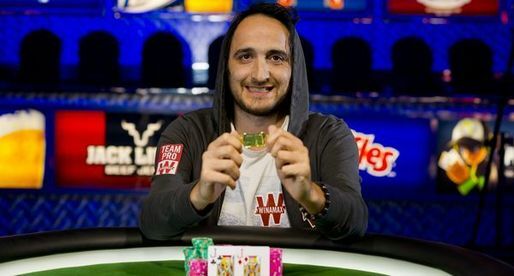 When it was all over early Wednesday morning in Las Vegas at the Rio Hotel and Casino, veteran Belgian poker player Davidi Kitai sat with all the chips. He earned his second gold bracelet at his fifth final-table appearance at the WSOP. Kitai and his opponents created a total prize pool of $916,500. He bested a final table that included notables such as Cary Katz, Dimitar Danchev, Eugene Katchalov, Bertrand Grospellier and Dario Minieri. Kitai entered as the chip leader. Kitai, winner of eight tournaments during his career, now has nearly $3.5 million in career tournament earnings between live and online play. He’s the first two-time bracelet winner from Belgium. This win is the fourth largest payday of his career. He won a European Poker Tour in 2012 for $930,816. He also has a small World Poker Tour win, making him a triple crown winner. With a fourth-place finish, Dimitar Danchev, winner of the PokerStars Caribbean Adventure in January, added more Player of the Year points. He currently sits in fourth.